In need of a Siesta Key condo for rent? Crescent Royale Condominiums has what you’re looking for. One of the many things that separates our condominiums from the rest is our comprehensive and convenient amenities. From your Crescent Royale condominium, you can step across the street to our beautiful Siesta Key beach to enjoy the sun and fun on the “World’s Finest, Whitest Sand!” Or you can take a few steps in the opposite direction to swim in our large heated pool or relax in a comfortable lounge chair. If you get hungry feel free to optimize the grills and picnic tables next to the pool area. Beside the pool is a shuffleboard court, or you can rack-up the pool table in our air-conditioned lounge or even gather for a game of cards. 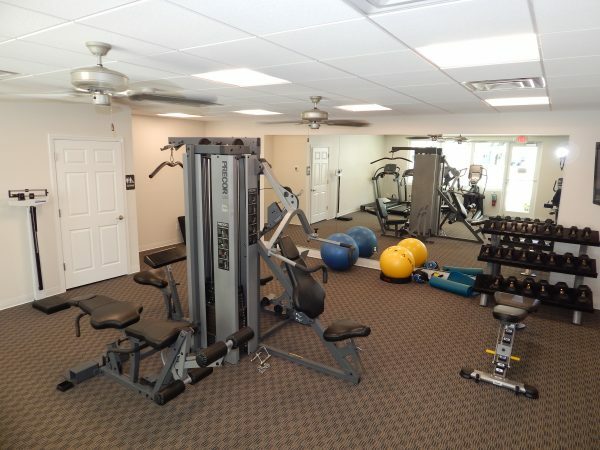 Our exercise room has a choice of cardio work-out equipment and weights with adjoining bathrooms. A banquet room above the lounge is handicap accessible and can be rented for meetings or social events. The kitchen is fully equipped. Overlooking the pool and the sunset sky, it’s a great place for a special event. You’ll enjoy the comfort and convenience of staying in a Crescent Royale condominium, with laundry facilities and elevator access on every floor. No matter what your heart desires in a beach vacation, know that it will be fulfilled at Crescent Royale condominiums. You can spend your days on our glorious beach and watch colorful sunsets from your condominium’s spacious screened lanai. Or sun bathe by the heated pool, relaxing with shuffleboard and pool. Call now to make your reservation for an exciting and memorable Crescent Royale vacation. Choose the accommodation that’s right for you and book online today! Crescent Royale – Community Video from PIX360 on Vimeo.